Lime green mesh scarf measures 34" x 7"
Did you know that the Daphne Blake character from Scooby-Doo was inspired by the sophisticated and money-hungry teen character Thalia Menninger from the late 50s/early 60s American sitcom The Many Loves of Dobie Gillis? If you weren’t addicted to Nick At Nite the way we were, that might not mean anything to you, but for the rest of us, that lil’ fact is pretty cool (also, if you haven’t seen The Many Loves of Dobie Gillis, look it up - it’s a great sitcom that holds up!)! Anyway - we know everyone has their own favorite, but for us, when it comes to the Mystery Inc, gang, we could never get enough of the fashion-loving Daphne! While not considered as brainy as Velma, don’t underestimate “Danger-Prone Daphne”…she might look cute, but she’s got black belt in Karate and can use her makeup accessories to open locked doors and cages! She’s also super flexible, which makes her hard to pin down in combat. And when it comes to hobbies, she’s got ‘em - she’s great at surfing, singing, and can tinkle those black and ivory keys like nobody’s business! What we’re trying to say is: It’s easy to look at a girl like Daphne and put her in a damsel-in-distress box, but she’s more than meets the eye! 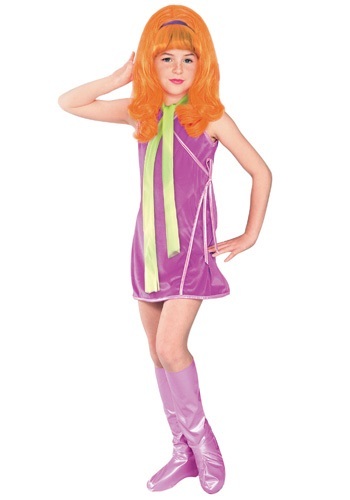 And if you’ve got a girl who brings her own unique qualities to the crime-fighting, ghost-busting table, then this officially licensed Child Daphne Costume is the perfect costume for her! She’ll be the coolest private detective in this sleeveless purple velvet mock-wrap dress that comes complete with Daphne’s signature lime green mesh scarf, shimmering pink boot covers, and bright orange wig with an attached purple headband! Get the whole gang together with our other great Scooby Doo costumes!